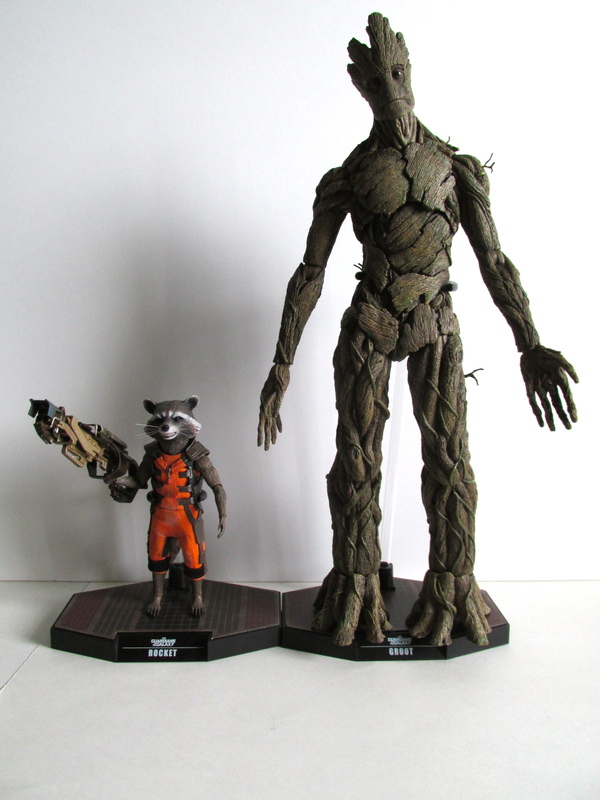 Rocket and Groot have finally made their Hot Toys debut following the releases of Star-Lord and Gamora. You can actually buy this set or buy each of these figures separately, however, the two set comes with more accessories that you can't get in their individual releases. I'm lucky enough to have gotten the set, and overall I'm liking it. By far Groot has the better sculpt than Rocket. Both have great attention to detail, but Groot just has some amazing paint and sculpt all throughout this body and face. 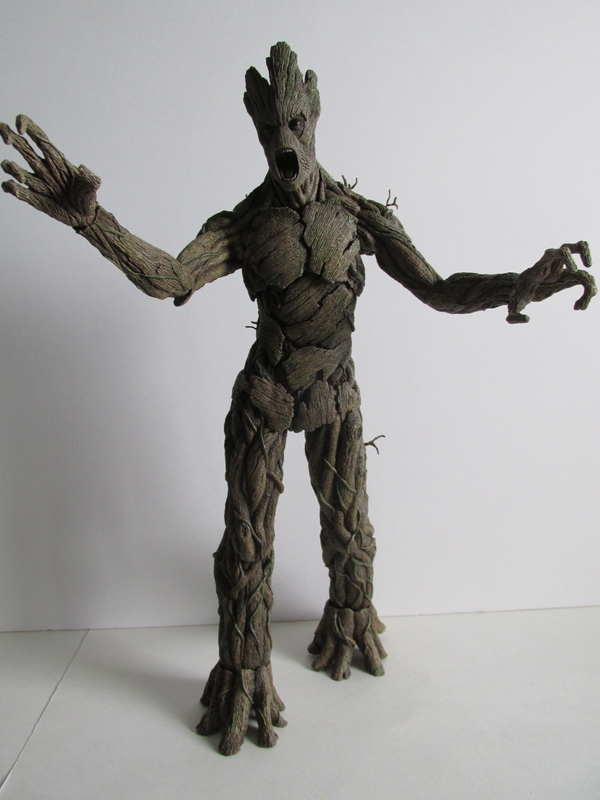 To me, Groot jumped out of the screen and into my hands. Rocket does have a good sculpt, but there is something in the sculpt of the face that is just not doing it justice. I'm just very impressed with the sculpt and detail for Groot. HIs roots look amazing and his facial features are spot on to the movie that captures his personality. 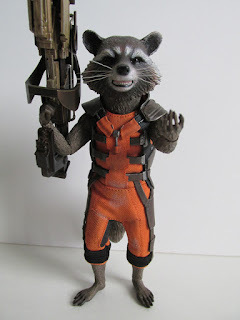 Maybe Rocket should have come with a neutral, serious alternative sculpt? I'm thinking that may have helped with his overall look. Both have mediocre articulation. Groot can move but his joints are really stiff, and I'm a little afraid of being rough with it since he has small twigs that stick out of his body that you don't want to break off on accident. Rocket has good articulation too, but his jumpsuit also hinders any leg movement in the knee. Rocket comes with his gun, a pair of tip toe feet, a pair of fists, one right gun holding hand, one relaxed hand, one pair of neutral hands, and his base. 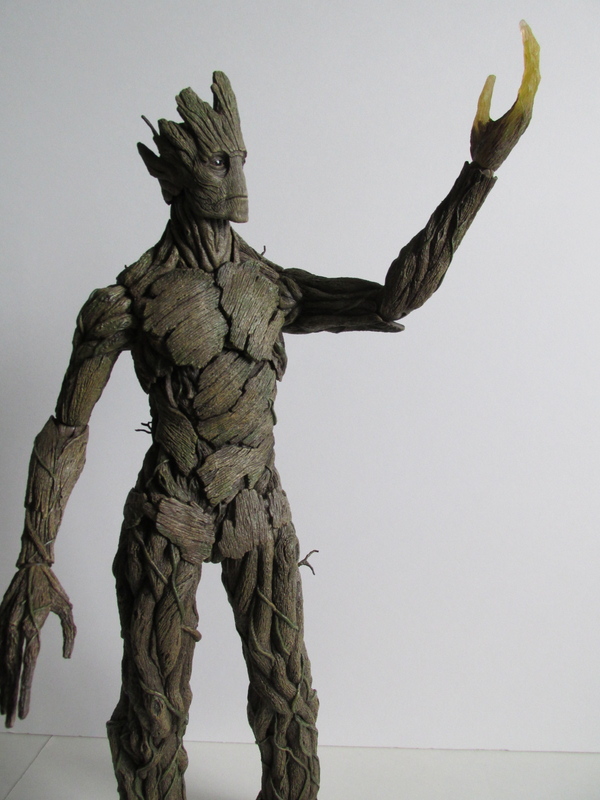 Groot comes with a pair of bendable finger hands and a base. 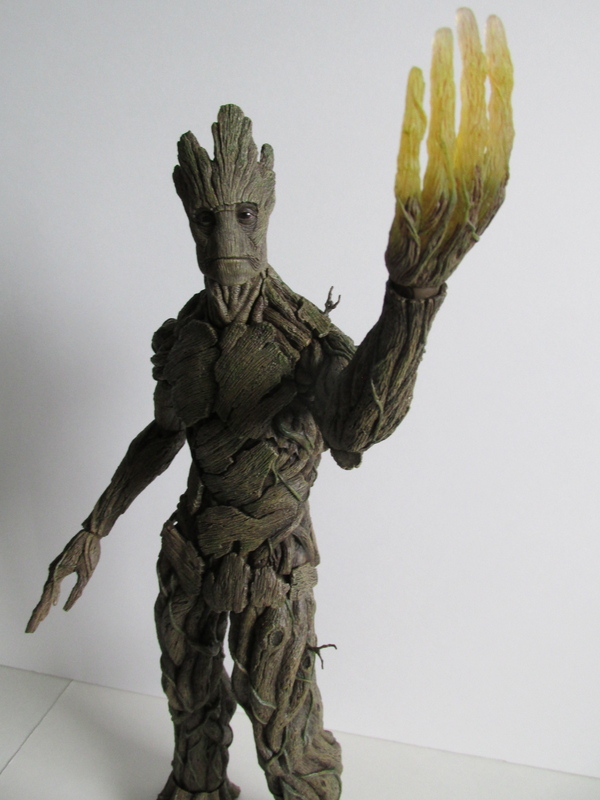 The exclusive version comes with glowing left hand for Groot, angry face Groot, a pair of claw like hands for Groot, potted Groot, and dancing Groot in a pot. The exclusive edition is the way to go with this since the normal editions don't really come with much at all. 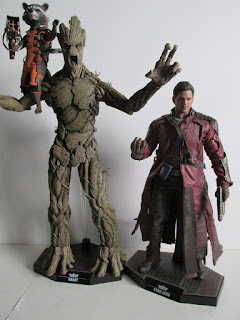 If anything you are buying these figures because you are a fan of the movie and the characters. 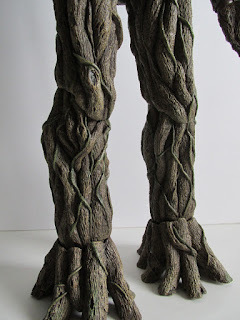 To me these are more like statues since their articulation is somewhat immobilized because of their construction. 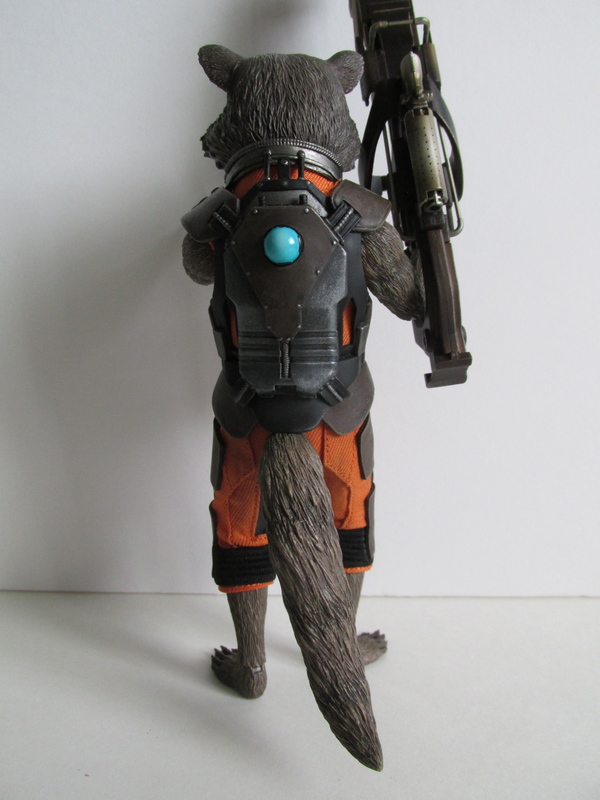 You can also have Rocket sit on Groot's shoulders with the aid of the clear rods and special clamp mount used to combine the two rods for both characters. I had a tough time with this since Rocket seems too big to stand on Groot's shoulders, and Rocket' can't really bend his knees so it's even harder to pull off this iconic stance. 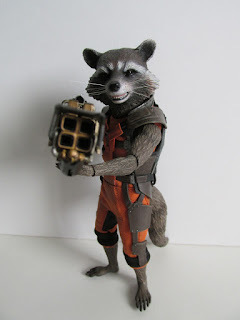 As a statue piece, I think these are great figures, but other than that this figure may not be totally worth its value. 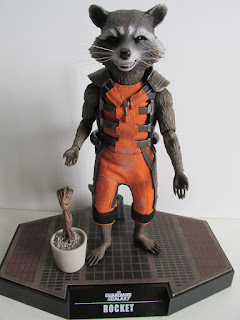 This set is on sold out at Sideshow Collectibles, but if you are a fan of the characters you totally need to get on this. 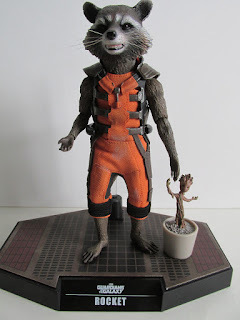 Otherwise, I would wait for Guardians of the Galaxy Vol. 2 figures.